Given how cold and snowy this winter has been, I’m excited about the trend toward big bold floral patterns on walls and fabrics! It’s the perfect design for spring - and beyond! I’ve always loved a pattern of flowers, but there’s something about an overscaled look that just takes my breath away. 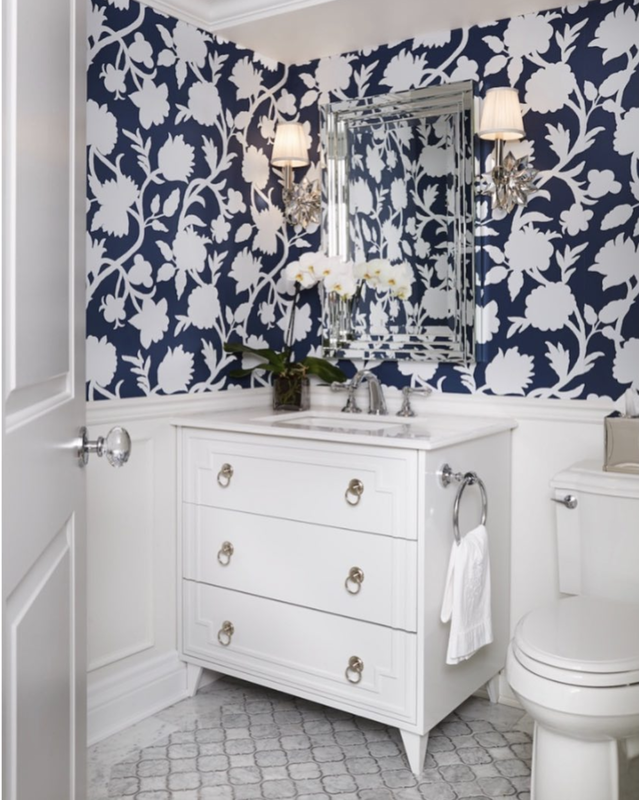 I fell in love with the Thibaut wallpaper above, with its classic navy-and-white palette. A powder room is the perfect place to experiment with a more dramatic look like this one! I literally stopped in my tracks when I saw this huge realistic wall of flowers at a home furnishings show here in Toronto! How stunning is this wallpaper from Rollout? It is absolutely gorgeous when you see it in person!! Victoria Larson took more of a painterly approach for her floral pattern on a grasscloth. It’s got a lovely dreamy quality to it! I’m so in love with these big blooms that I’m offering the look on pillows on my online shop! This combination of navy, light blue, and lavender is a great colour mix! Click here to get this pillow for your own home. What do you think about this floral trend? Does it have you dreaming of warmer weather? Me too!! !